'Mellow Out' was the pinnacle of achievement for guitar driven brain crushing madness from the Japanese trio consisting of Asahito Nanjo (High Rise), Makoto Kawabata (Acid Mothers Temple) and Hajime Koizumi. Originally released on CD back in 1996 on the Charnel label, the pressing quickly disappeared and has been unavailable ever since making it one of the most sort after masterpiece's of the Japanese underground. Now brought back to life not only on CD but for the first time ever on limited vinyl too. ‘Mellow Out’ was originally released by Charnel Music 1996 (CHCD-19) licensed to Riot Season 2003 with thanks to Mason Jones. Just like a heavy-er, psychedelic-er High Rise, in fact - a guitar line, some vocals, then a 'lead' 'break' of so phenomenal a level of crazed distortion that I had trouble persuading my CD player not to implode. Now that hard-psych options for non-cretins are reduced to either records made by old men that I'd rather not have to sit through or a suckers-only market where big losers pay big liars big money for little records, this is what amp-worship should sound like. 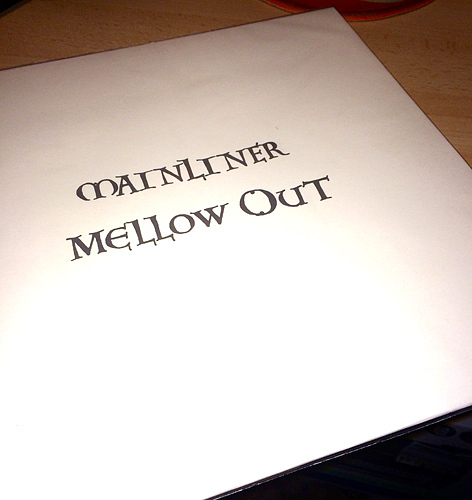 Where other artists will have you tearing off the CD and slamming it into the toaster in frustration, Mainliner is choc-a-bloc with riffs'n'hooklines, as well as gimmicks to keep you listening and devices to sneak you in the back door. Mainliner are never reduced to chordless pedestrian pseudo-jazz like so many Noise bands, never drywanking the No New York kerb crawl beloved of art-dweebs worldwide. Instead, they are forever maintaining and sustaining a constant and practised bulldozer-y heavy-in-concert rockness that keeps the showman at play, but not the shaman at bay. These are skilled magicians and master technicians practising an odd and thoroughly honed form of sonic healing. Rock! Mainliner sound nothing like the Ruins and are only slightly reminiscent of AMT; it's a perverse experiment in motorpsycho, heavier-than-you-can-imagine rawk noise. Vocals are heard, but indistinguishable, while Nanjo's bass plods mercilessly ahead. Koizumi moves like lightning around his kit, crashing cymbals and banging away like he's drilling a hole into a concrete wall. And then Kawabata is thrown into the mix, and what might've maintained some semblance of sanity begins sounding completely demented. This is easily some of the sickest psychedelia you might ever hear. The distortion is relentless, mounting in a hallucinatory haze of fuzz and feedback. Not for the meek, and don't let the title fool you. This vital piece of the Japanese psychedelic rock scene is finally seeing a reissue courtesy of Riot Season. Up to now the number of references to this album I've found in the description of other records vs the number of copies of this I've actually seen available for purchase have been enormously disproportionate. Boasting the membership of Asahito Nanjo (of High Rise), Makoto Kawabata (of Acid Mothers Temple, and countless others), and Hajime Koizumi, it's no wonder this album is of great note. 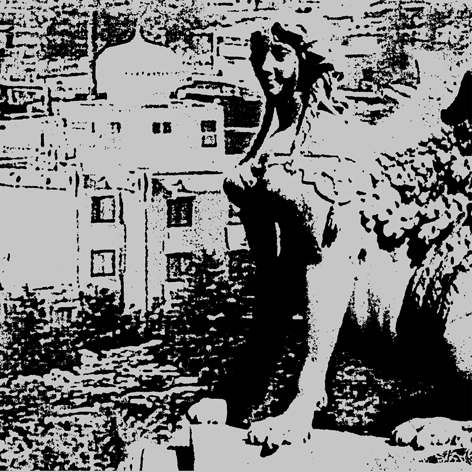 High Rise and Acid Mothers Temple (mostly just Electric Heavyland) give you a ballpark estimation of what Mainliner are about: heavy rock, psychedelic solos, and noise. 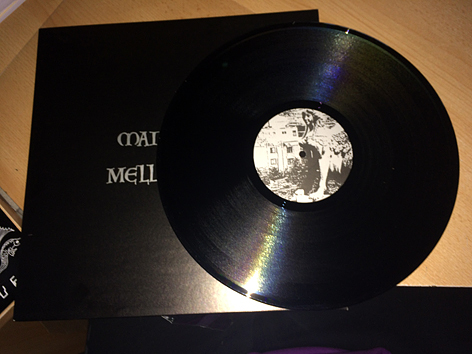 The 35-minute album is split into three tracks. The opener, "Cockamamie," stands out as it's under 2 minutes! The drums distort beyond recognition, the bass grooves on beneath the rhythmic chaos, and Kawabata's guitar stretches its legs for a quick minute and a half solo. Then the real workout begins. "Black Sky" clocks in at a brutal 15:17. Asahito's reverb soaked vocals pepper the first few minutes as the band holds the same riff. Shortly after he stops singing, the floor drops out, and Kawabata's guitar loses control. The drums and bass speed to a blur, matching Kawabata's noise, but the guitar gymnastics steal the show, giving more than enough fodder for calling Makoto a "guitar god," as many have done in the past. The more than eighteen minutes long "M" closes out the album very strongly. There's more of a "song" with parts that act as a verse, a (for lack of a better term) chorus, and, of course, a solo. After Kawabata spends 7 minutes abusing the listener with a mind splitting solo, Mainliner reign him in and bring the main riff back, and the vocals return. Makoto sharpens his teeth and after a short respite jumps back in, creating a wall of bedlam that seems to almost overtake the bass and drums which is replaced for a short coda of the main riff before devolving into complete chaos and ending in a heap of feedback and crashes. In three tracks totaling thirty short minutes, Mainliner obliterates everything in its path. “Black Sky” lays down a thick, plodding riff until Makoto Kawabata’s “motorpsycho guitar” and drummer Hajime Kozumi explode four minutes later. In one swift second, a Sabbath-sized weight alights into the air and gravity disappears. When that riff becomes a furious free-for-all, in that single moment of transition, the skies clear and the storm clouds turn sunny. Kozumi rattles on his snare and then drops away. 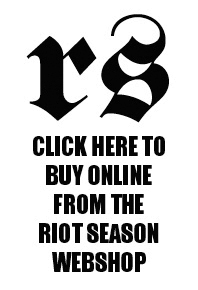 Not for long, however. Distortion becomes a fourth member of the band, the fog through which recognizable elements sometimes emerge. Drums tumble, crash, and clatter everywhere while guitar scree and squall circle relentlessly. Eventually they regain their footing and return to The Riff while Nanjo’s phantom vocals sit above the bog. These vocals hardly exist; they are shadows without any object, reverberation with little articulated content. Relatively speaking, this could be called a breather, until four minutes later when another eruption pulls the rug out. Around fifteen minutes after beginning, the fury somehow subsides. “M” establishes a bottomless crunch that would send Blue Cheer hiding behind their stacked Marshalls. Nanjo and Kozumi stick together on a riff and rhythm as Kawabata peels into the fiery heights of his guitar. On occasion he descends from the skies to add more mess to the low end – these are moments when the equipment might just give up the fight. No sound is distinct. The volume is too high, the distortion too thick; the speakers rumble in exhilarated pain. 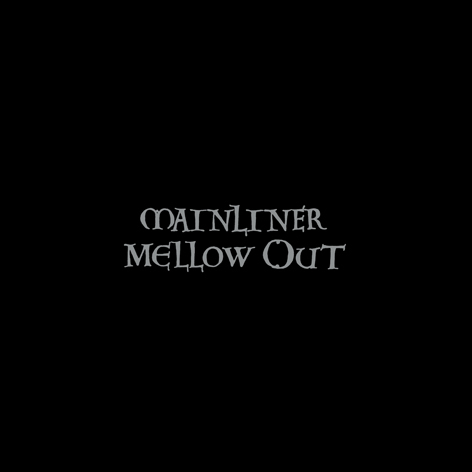 Originally released in 1996, Mainliner’s Mellow Out quickly sold out its pressing and hid among the ghosts of underground myth and record collector whispering. Those who heard the record proclaimed it as a pinnacle of Japanese heavy psychedelic music, one of the heaviest records to emerge from perhaps the heaviest scene on the planet. Even seven years later, after a few more releases by Asahito Nanjo’s High Rise, and after a mountainous output from the Acid Mother’s Temple, this album should not be discarded as just another record in the genre. Mellow Out is not the speed garage of High Rise, nor the precision prog of The Ruins, nor the cosmic trip of the Acid Mothers Temple. It is a pure distortion meltdown with little regard for the limitations of time, rhythm, or volume. Asahito Nanjo said that the terrorizing levels on Mellow Out were done out of love. Mellow Out, and perhaps the entire output of these Japanese guitar gods, reflects not only a love of volume, but also a love of inflating every musical excess hard rock had to offer. 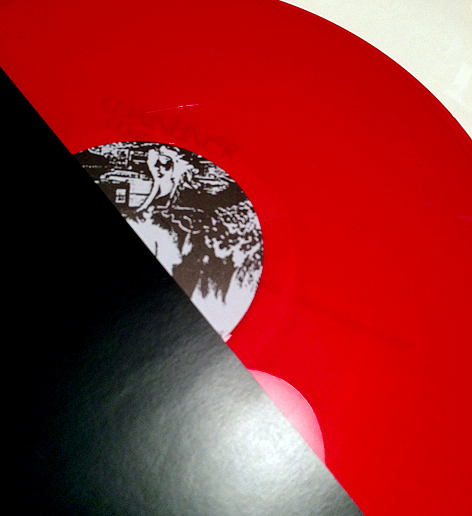 At last, a reissue of the debut album from Japanese heavy psych trio Mainliner. It came out on Charnel Music in '96, but has been out of print for a long while now and with its unavailability has grown in stature. Of course, it's a great record, the one that Acid Mothers Temple were trying to emulate on their recent "Electric Heavyland" set. And yep, it does feature AMT's Kawabata Makoto on 'motorpsycho' guitar, along with free jazzer Hajime Koizumi on drums and bassist Nanjo Asahito of the legendary High Rise. 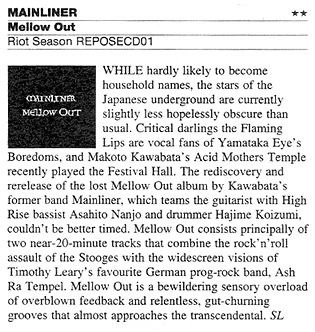 Mainliner always was just a slight variant on the High Rise template (themselves a variant on the Les Rallizes Denudes template it seems), formed originally by Nanjo 'cause his High Rise bandmates were averse to touring and he wanted to take his rock on the road, or so the story goes. Anyway, this disc was Mainliner's first and best, all players outdoing themselves in the realms of psychedelic heavy garage improv distortion overload. So, if you missed it the first time around, now's your chance to experience this classic. It's nice to have it back in just 'cause now we're listening to it again and we'd forgotten how great it is. Rock!